Portugal's credit rating has been downgraded from AA to AA- by leading credit rating agency Fitch over concerns about its high levels of debt. 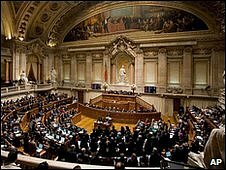 Earlier this month, Portugal passed an austerity budget aimed at cutting its budget deficit. The downgrade heightened concerns about the health of some of Europe's heavily indebted economies, forcing the euro lower against the dollar and the pound. The euro slid against the dollar to its lowest point since May 2009. It dropped 1.5 cents, or 1.1%, to $1.3346. Against the pound, the euro fell 0.2 pence to 89.55p. The downgrade also sent major European stock markets into negative territory. "A sizeable fiscal shock against a backdrop of relative macroeconomic and structural weaknesses has reduced Portugal's creditworthiness," said Douglas Renwick from Fitch Ratings. The Portuguese Minister of Finance, Teixeira dos Santos, said it was key to maintain efforts to cut the budget deficit in order to differentiate the country from Greece. "I am worried because we know that markets overshoot sometimes in their reactions," he said. "The risk exists, I cannot ignore that." The downgrade could mean Portugal has to pay higher yields on government bonds to attract investors, making it more expensive for the country to borrow money - even though other leading ratings agencies may not necessarily follow Fitch's lead. Analysts stressed the wider European impact the downgrade could have. "The downgrade has more impact on the wider sovereign debt crisis, rather than on Portugal at the moment," said Peter Chatwell at Credit Agricole. There have been widespread concerns about the high levels of debt of a number of European countries, most notably Greece. At the end of last year, Fitch and Standard & Poor's, the second of the three major international credit ratings agencies, downgraded Greek government debt. European leaders are currently discussing how best to deal with Greece's debt crisis.